This recipe came to life in my kitchen only after i saw it on SEDenufood. In one of my childhood memories i remember eating rice & chana dal pulav while sitting in a train going for vacation, one of my aunt made that. It was so simple but so vibrant at the same time....white basmati rice like they are smiling & yellow vibrant chana dal peaking from every where. I still remember that it tasted good and that picture is still there in my mind.So, on Monday when I saw it on SE's blog I told to myself i have to make it. Originally I was planning to make it white only but.......when I opened my cooler box to get something I saw the bottle of rasam paste..........(I know what you all must be thinking store bought rasam paste......who use that......well, we wanted to try it). Anyways, so plan changed a little bit, here's my version of this pulav. 1) In pressure cooker heat the oil then add jeera, cloves, cinnamon stick, mustard seeds & red chillies, when seeds start to splutter add sliced onion. 2) On med. high gas saute the onion till they become brown. 3) Now add rasam paste & 3-4 tblspn. of water to loosen up the paste.Add salt, paprika, rice & chana dal, stir everything together.Let everything get coated with the masala(spice & onion mixture)around two minutes. 4) Add 4 1/2 cups of water* and pressure cook it on med. high . After a whistle turn off the gas. If your stove is electric make sure you take the pressure cooker off the heated stove.after around 5 minutes open the cooker & using fork fluff up the rice.Serve it with plain yogurt/raita. 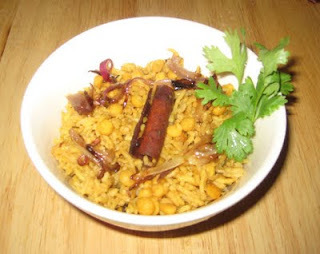 Note : *I use 1(rice) : 2(water) ratio while cooking rice in the cooker and I added 1/2 cup extra for chana dal.If you pressure cook rice, make sure not to let them sit for a long time in the pressure otherwise they will be overcooked & become mushy. hey..with rasam paste...I am sure this must have been yummy.........looks very delicious..btw if you dont mind..may i know your name pls..